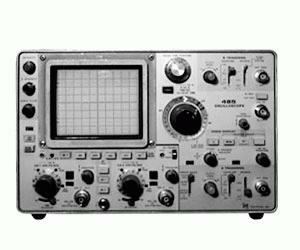 The 466 Portable Storage Oscilloscope is designed to display nonrepetitive or slow moving signals. Operating in a reduced scan mode, the stored writing speed is 3000 div/microsecond (1350 cm/microsecond). This instrument features two modes of storage - variable persistence and fast transfer. The bright 8 x 10 div CRT has 0.90 cm divisions. A reduced scan 8 x 10 div graticule is sumpermposed over the center of the main graticule, with 0.45 cm divisions. The graticule is etched onto the inner face of the CRT to eliminate parallax problems. A third channel trigger view allows the simultaneous display of channels 1 and 2 with the external A trigger. Lightweight plus the ability to use optional external dc power makes the 466 sufficiently portable for virutally all field measurement applications.